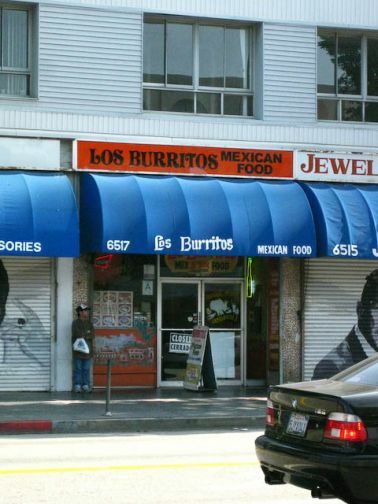 At first glance Los Burritos may not seem so inviting. Its aging interior, dated wall murals and red vinyl booths do not scream fine dining. But, it's often the hole-in-the-wall locations that offer the most authentic and delicious food. And, given that it's located on Hollywood Boulevard in Los Angeles, which is full of rip-off merchants and tacky costume shops, it truly is an oasis. With delicious and cheap Mexican food, a range of beers for only $3.25 and fresh juices and friendly staff, it's hard to go wrong. A beer/juice and a meal will set you back around $10, and will definitely fill you up. The beef burrito with red sauce is chock full with chunks of beef and beans. The tostadas are fresh and delicious, and the enchiladas cheese-covered and steaming fresh. It's hard to be motivated to cook for yourself as a traveler when something like this is so cheap and accessible. And, if you choose wisely, it can also be quite healthy. If you ask nicely the waitresses will make up a fresh and nicely spicy chili sauce comprised of cilantro (coriander), onion, fresh green chili and red chili sauce. It adds a great kick to your burrito. Los Burritos is at 6517 Hollywood Blvd between Schrader Blvd and Wilcox Ave. They also do take away and deliveries.